Samsung dishwasher displaying an error code? Newer style Samsung dishwashers have built in diagnostic systems. If your dishwasher finds, sees, or detects a fault or error in the system, it will show an error or fault code. The error code will display where the usual numbers are on the display screen. When an error code is displayed, your dishwasher is telling you a specific fault. You can also search YouTube or get advice from your dishwasher owners manual when your Samsung Dishwasher Is Displaying An Error Code. Repair and or check: Check the spray arms on the dishwasher and inspect for lime or debris then use a descaler to dissolve the lime buildup. Follow Up: Run short cycle with the spray arms removed to clean area. Repair and or check: Unplug the dishwasher to disconnect electrical power. If water continues to fill the tub, replace the water inlet. If filling stops when you disconnect power than replace the main power board assembly. Repair and or check: Make sure that the water supply valve for the dishwasher is open. Unplug the dishwasher and shut off the water supply. Disconnect the fill line and check the water inlet valve. If the inlet screen is blocked, replace the water valve. Check the wiring connections on the water inlet valve and secure loose connections. If the water valve won’t open when activated then replace it. Repair and or check: Check the temperature of the hot water at your faucet. If the temperature is over 120F degrees then lower the setting on your water heater. If the water temperature is below 175 degrees then the thermistor (temperature sensor) is defective. Replace the thermistor. If the problem keeps happening then replace the main power board assembly. Repair and or check: Clear any blockage from the sink drain. Unplug the dishwasher and clear blockage from the dishwasher drain hose and drain pump. If the drain hose or the drain pump is damaged then replace it. Repair and or check: Empty any deep dishes that flipped and have filled with water. Restart cycle. Adjust the feet on the dishwasher if it is not level. Reconnect any loose wires on the wire harness for the water level sensor. Replace the wire harness if damaged. If the wire harness connections are okay than replace the water level sensor. Repair and or check: Press all the buttons on the control panel to attempt to free up the stuck key. If keys remains stuck than replace the control panel. 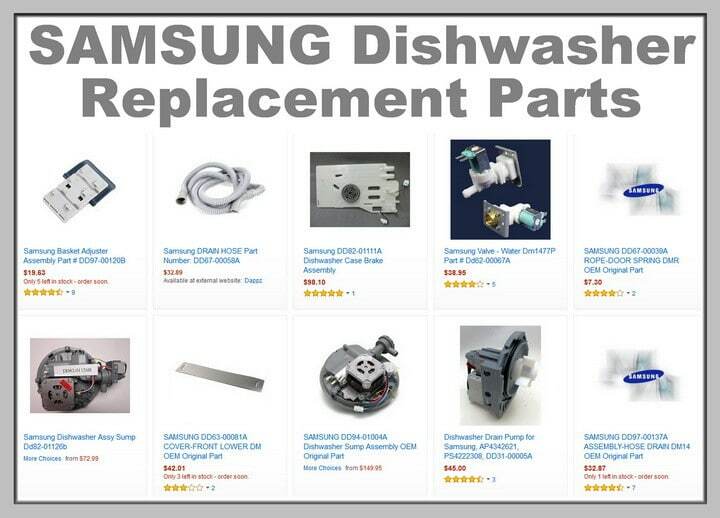 failed, here are Replacement Parts for your Samsung dishwasher. Repair and or check: Unplug the dishwasher and check the wiring on the heater. Replace the heater if it’s damaged. If the heater is in working order than replace the main power board assembly. Repair and or check: Unplug the dishwasher to disconnect electrical power. Open the dishwasher door and check the temperature of the water in the tub. If the water is close to 175 degrees, the heater relay on the main power board assembly is stuck in the closed position – replace the main PBA. If the water is less than 175 then the thermistor (temperature sensor) is probably defective. Replace the thermistor. If the problem persists than replace the main PBA. If lights are Highlighted above the Heavy, Delicate and Quick button, but not over the Normal button, this means that your dishwasher has a Temperature Sensor problem. Repair and or check: Run an empty dishwasher cycle with detergent. If the lights still display the same way, replacement part is needed. Reason For Error Code: Dishwasher thinks that the door is open. Repair and or check: Close the door properly and see if the lights go away. If not the door switch is faulty. Repair and or check: Check for water leak under the dishwasher. Check the hoses, drain pump and tub. Replace any leaking components. Repair and or check: Unplug the dishwasher to disconnect electrical power. If water continues to fill the tub, replace the water inlet. If filling stops when you disconnect power then replace the main power board assembly. Repair and or check: Unplug the dishwasher. Reconnect any loose wires on the distributor plate motor and microswitch. Replace the wire harness if it is damaged. If the wires are not damaged, replace the distributor motor assembly. This includes the distributor plate motor and the microswitch. Repair and or check: Unplug the dishwasher and reconnect any wires on the on the thermistor wire harness. Replace the wire harness if damaged. If the wire harness is in working order, replace the thermistor. If the problem persists then replace the main power board assembly. Do you know of any other Samsung dishwasher error codes we have not mentioned or are you having trouble with your dishwasher? Please leave a question or comment below and we can assist. Our samsung dishwasher has the error code F5 which is not mentioned on your website. Any idea what it is? Whats Happens: blocked, clogged or damaged spray arms. What TO DO? : Check the spray arms on the dishwasher and inspect for lime or debris then use a descaler to dissolve the lime buildup. Run short cycle with the spray arms removed to clean area. Light indicator flashing rapidly with blinking heavy and sanitize light blinking and gurgling sound every 10 seconds. Samsung dishwasher. Any ideas. I have a Samsung Dishwasher series DW80J7550US. When we start a cycle, a few seconds after the start, we hear a grinding sound, then it stops and the front blue light flashes 3 times and it beeps 3 times. It does the same no matter what cycle we chose. I changed the inlet valve and it did not make any difference. Same issue here, anyone figure this out? I can’t find any info. It used to start so quietly, now it makes loud grinding noises, then flashes and beeos 3 times. It waits a minute and does that 2 more times. Eventually it starts. Dishes aren’t as clean as they usually are. I’ve cleaned the whole thing and checked all parts. This is the second time I’ve had the heavy and smart lights flashing after starting cycle and quitting after about 20 minutes. It’s the leak detection sensor. My dishwasher is only 5 years old. Two years ago, the first time I paid sears $250 to have a professional come out who had to replace the faulty detector – by the way there was no leak. Now this is the second time. Leak detector seems to only be good for about 2 years. I will not pay for it again. I am going to buy a Bosch. This problem seems to be a very common issue and they don’t seem to care, back their product or fix the issue. Good luck! You didnt mention error code “lc”. My brand new samsung dishwaaher worked fine for a week until my plumbing managed to become clogged. I have successfully snaked my drainage system and sinks are draining better than ever. The machine however still thinks theres water to be pumped out and constantly displays error code LC. Dw80k7050us. I have a Samsung DMT400 that is showing an error with two blinking lights, HEAVY & DELICATE. What is the cause for this? We just got a stormwash about two weeks ago. It only runs about half the time. When I try to start it, the number 1 is displayed where the cycle length should be. Then it sounds like its going to come on for about 20 seconds, then it stops. I’ve read the manual several times. I’ve turned it off, then back on. I’ve tried different cycle settings. This just keeps happening and it’s very frustrating. I really wanted to love our new dishwasher. Make sure you have Jetwash in the little container bin. Mine stopped working and I had to call a technician who figured out it was because I didn’t have Jetwash in the little fill container. My dishwasher kept stopping like that, too. If you hold the start button down to long it will display a # 1 and attempt to drain. Model #DW80J7550US. Kept chiming sound with O C flashing? I just purchased a Samsung DW80M202US…after powering it up my normal light flashes and beeps. When I try to power it off it turns off…then starts again. I need help please! I just installed the same model dishwasher and I am having same issue. Normal light blinking and the dishwasher is beeping. How did you resolve? Have Samsung dishwasher 2 years old. I have a Samsung DMT610RHS dishwasher. It has never really done a great job of cleaning the dishes however the biggest problem is that it would simply shut off during the cycle. Not necessarily in the same spot. I would open the door and the panel would re-engage at different stages of the door opening. When I would close the door again, it would most often shut off. Once in awhile, I could re engage it and the cycle would finish. Now it won’t even turn on. I have a Samsung DMT800RHS with the error code CE flashing. After doing some digging I found it means communication error but I can’t find anything on how to fix it. I tried flipping the breaker but it sounded like it was cycling without water (whether the door was open or closed) and kept flashing. Mine is doing this as well what did u do? Samsung Dishwasher F3 is a water leak in the base. Water has overflowed when the bowl water went into the dishwasher and will have leaked into the base. Pull the dishwasher out and tip it 45 degs backwards. This will allow the water to drain out. Once the water is out of the dishwasher, the antiflood switch will reset itself and the dishwasher should work. Let us know what you find. I have a chef collection waterfall Samsung dishwasher. The numbers light up on front. First it kept reading 888 but everything still works. Now it reads O, O. It still works fine but instead of the time left Lit up on the front it has this O,O. When it’s finished it lights up with some lines that don’t even make sense. Samsung Dishwasher – No error code when running, but does not fill. We have a DW80J755 series dishwasher that will drain and the after about 30 seconds, shows “End,” not starting the fill cycle. I can run the Inspection mode, and it will fill the 4 liters which rules out the inlet valve. In the inspection mode, the first quirky thing we run into is in the n1 sequence, it should give a turbidity voltage reading of 3.2V to 32V, but we’re getting 0426. Started at 0429, moved down 0427, 0426 and staying there for several minutes–don’t know if that’s voltages, or what that is; my service manual lists about 16 different models and 3 series of dishwashers. I finished the test and all seemed normal except for the voltages I mentioned, so conceivably, i could run the dishwasher with the test mode, but it will only drain and then not start normally. And I swapped-out the Main PCB Board to no avail, still drains but will not fill (and start wash cycle). Just installed A Samsung Dishwasher DW80K5050US. Upon power up ALL lights on panel blink in unison and i can get no operation at all. Try unplugging the Samsung Dishwasher for 5 minutes. If that does not stop ALL lights from flashing, try pressing and holding the RESET button. The heating element heats up the water to temperature. If the water doesn’t reach the proper temperature after a set amount of time, a light on the control panel may start flashing. The drain pump forces water through the drain hose. If the drain pump is not working correctly, a light on the control panel might start flashing. To be sure the drain pump is faulty, check the pump motor for continuity using a meter. If the motor does not have continuity, replace the drain pump. I have a DW80H993US dishwasher. No matter what cycle I choose 10 seconds into it a grinding sound starts and then by about the 30 second mark it beeps 3 times and the handle light flashes 2 times. No lights or codes appear on the top. It will not complete a cycle or get past this part. I’ve tried reseting the circuit breaker, I’ve also used the manual hold the start button for 5 seconds to restart. Is the chain that pulls the water wall thing replaceable? I have a DW800F600, I had difficulty with flashing overfill error lights, I found a reset code by pressing two things on the panel several months ago which worked for us and the dishwasher worked better then ever. Now its back and I can not remember the code or the two panels to push to reset. Can you help me to reset my machine to reset it again. Samsung dishwasher is showing two lines and will not turn on. It just beeps… any ideas what’s wrong as it’s only 3 years old. Samsung Dishwasher Error LE = Water leaked into the base pan below the dishwasher. Uninstall the unit and tip the dishwasher on it’s left side to drain all the water out. Then reinstall the dishwasher and see if the error comes back. If it does then that requires the main circulation pump assembly to be replaced to fix the error. I have a series DMT 400 Samsung dishwasher. The code has both the heavy and smart auto light flashing. What is the problem, and how do I fix the problem? I have Samsung dishwasher DW80J994 series. It’s made a little noise for last couple months but seemed to work fine. Just today the front led light started flashing about 1mn into running and at same time it beeps 3 times. No error code but it does really run the cycle. After a few mins i’ll open the door and timer is same at start i also haven’t noticed any lights on. I’ve checked nozzle clearance and bottom drain filter. No issues. Extra note: I put about 3 cups of water in the bottom and it worked fine. also having the same issue, anybody come up with a solution? Also having the same issue. It sounds like the noise is the pump trying to pump water out of unit but no water is left in it. Prior to starting cycle a bunch of pre-checks occur with these. One of them is to check for water from a previous cycle and if it exists pump it out. I suspect the issue may be the water fill sensor. I’m calling tech support. Will update if they fix it. I have a Samsung dmt400rhs dw turns on then 5 to 10 minutes later it turns off and the delicate light flashes. As usual, it starts draining but after the 30 usual seconds even though all water is gone it still tries to drain. No water enters at all and same lights flash while it keeps trying to drain. Can’t turn it off unless I use the breaker. Following the wrong suggestion (by Samsung!) I already replaced the drain pump. As you suggested, I took the control board out. Everything looks good, nothing is disconnected unless there is a pro way to test it, I’m the most amateur guy you’ve ever talked to. Do I have to replace the control board even though visually looks good? It’s $161. There is no version model between the model # and SN. Model is dw80f600uts/aa. I saw online that the replacement is the one that has the same sticker inside that says R4 F600, I checked mine against the pic of that one and they look exactly the same. It is possible the board is faulty even though it is visually okay. You don’t see any burnt spots on the board? No fried melted parts on the board? Have you checked all wire harnesses and make sure all components are getting power? You could check the board out but most likely if you have checked absolutely everything, the the board is the fault. Here’s my how-to fix for the oE error without the need for any parts. Works if the problem is not the water inlet valve. My Samsung dishwasher model is DW80F600UTS/AA. The Smart Auto and Heavy lights flash right after trying to run it. The first thing done was to turn the breaker off for 20 minutes without success. After checking in the manual and speaking to a Samsung tech support person we all agreed that there was a draining issue. By that time there was some leftover of water at the bottom. Since what needed to be done was cleaning and replacing the drain pump, I did it myself following some good detail explanatory videos. Now that everything under the sump filter and also everything under it was cleaned and the drain pump was replaced, it still shows the same error code but there is no water at the bottom. What can it possibly be the issue if it’s not the drain pump? While lights keep flashing, the unit still tries to drain but there is no water left inside. There is no sign that there is water draining to the sink’s pipe (usually I can hear the water draining). Right after I set it up to run the lights start flushing and it doesn’t even start. Does water enter into the Samsung dishwasher at all? Is the drain pump turning ON at the correct moment, but keeps running even after all the water has been pumped out? If so it may be a faulty control board that is causing the drain pump to run continuously. Have you opened up the front panel and visually inspect? There could be a stuck or faulty relay on the control board. Heavy light stays on, keeps draining,can’t reset, no water present. Can’t turn off without cuting power supply off. I turned the breaker off for 30 minutes. The model # is DMT300RFW. My Samsung dishwasher has an error with the normal, heavy and quick lights flashing. Can you please give us the model number of your Samsung dishwasher? Have you tried to simply unplug it from power or the “mains” to reset the board? THANK YOU!!!! This explains why it works after we transported it to our tech guy! My Samsung dishwasher gives an error code F3. Technician guy doesn’t know what it means. Somehow he resets the machine and send it back TWICE. The salt-light doesn’t go off, even after a refill. Samsung Dishwasher F3 error code message = Water leak in the base. Water overflowed into the dishwasher and leaked into the base. -Pull the dishwasher out and tip it 45 degrees backwards. -The water will then drain out so use some towels or a small bucket. -After you remove all of the water in the bottom of your Samsung Dishwasher, the antiflood switch will reset itself and the dishwasher will work. I have a Samsung Dishwasher DW80F600 Series. I am having a blinking code “Delicate”. It states a drain error. Is this the same as a SE error? I have checked and the drain is not clogged or folded. What else should I check and is there any YouTube videos? I appreciate any and all help. There is a sensor in that particular Samsung DW80F600 Series dishwasher. The error code relates to a DRAIN issue but it has been known to be a dirty sensor if the dishwasher is draining with no problem. Remove the sensor and you will most likely find some buildup on it. Clean the sensor off and put sensor back into place. You can access the sensor by removing the sump filter at bottom. If you have issues finding the sensor, check your Samsung dishwasher DW80F600 manual here. Just purchased a Samsung black stainless steel dishwasher model: dw80j7550ug about 6 months ago. When I press the power button, the unit powers on, I can select a wash cycle, then press the start button. 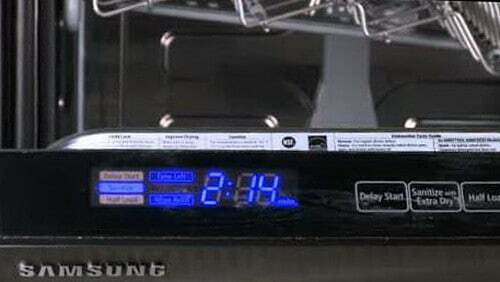 The display shows a “1” then proceeds to I believe move the arm that moves back and forth to make sure nothing is blocking it’s way, once the arm gets back to its “home” position, the display says “End” then sings it’s little song and does not start the wash cycle. Trying some more troubleshooting. I poured some water into the bottom of the dishwasher, then I pressed the power button, then pressed start and closed the door. I have tried looking for a code of “1” but the book does not show that error code and have not been able to find the code on the internet. There is correct power and water to the unit, there is nothing causing a blockage, I removed all dishes from the washer just to be sure, I cleaned the little filter located at the bottom (although it was not dirty or clogged), no buttons are stuck as it has the top buttons and door is closed. Any ideas of what could be the issue? I didn’t expect problems out of this very expensive dishwasher already? Did you ever figure out what was causing this or how to fix it? I’ve had mine about six months, and it does that all the time! My Samsung DW7933LRASR dishwasher starts and then stops after about 5 min and flashes the “quick” light repeatedly. We turned off the power at the breaker a few times for up to an hour but, when we start the dishwasher again, the same thing happens. Any ideas for what the problem might be?? Thanks!! I have a Samsung DMT400RHS/XAA and all four (Normal + Heavy + Delicate + Smart Auto) lights are flashing. Checked the owner’s manual and elsewhere online for what this combo means, no hits so far. None of the buttons respond, even using Heavy+Delicate+Power to enter troubleshooting mode. Dishwasher is on dedicated circuit, flipping the breaker does nothing. Also hear the drain cycle for about 10 seconds when I turn the breaker back on, then nothing. Most dishwashers will FLASH all buttons or icons if you inadvertently press another button while starting the dishwasher. Either that or the start button was pressed 2 times and it is in a delay or pause mode. Have you tried unplugging for 10 minutes, plug back in, shut dishwasher door, let sit 30 minutes…. What happens? Still all 4 flashing? I’m inclined to think something has went wrong with the circuit board. That would explain the strange error light pattern. Thoughts? Update 08/13: Replacing the PCB Main Board (DE92-02256C) did not resolve any of the symptoms. When I restore power, all four touch panel lights still flash in unison, touch panel does not respond to touch, drain still activates intermittently. Will attempt to replace the touch panel next. UPDATE: Replaced the Control Touch Panel and that resolved the issue. Cycled the dishwasher, no issues. For future reference & searchability: DMT400RHS/XAA with all four (Normal + Heavy + Delicate + Smart Auto) lights blinking means the touch panel is faulty. Must replace with part DD97-00104C Dishwasher Control Panel. Did anything change after you pulled the Samsung dishwasher out and cleaned the Overfill Sensor? Is the dishwasher still starting, stopping and then the normal light is blinking? Yes! Still starting up and seems to be draining then stops. Then the SMART AUTO light blinks. I have a new Samsung dishwasher model: DW80J7550US which has the waterwall feature. From the start it did not wash anything on the bottom rack well at all and it seems the waterwall was not cycling. After a few service calls the following things have been replaced: Main bored, Vain assembly, Nozzle cover, lower nozzle assembly, and rail assembly. (not in that order). After the last call it doesn’t run at all. Looking into it more it seems that the waterwall cycles (loudly) but no water comes on. I put my phone in to verify and the waterwall will move forward and back. it sounds like the water is trying to come on but nothing. Then the same error pops up that the waterwall cannot cycle. I know the water is getting from the line to the dishwasher. Any ideas? There can’t be too many more things to fix…..
Why was the Water Inlet Valve not changed? That is what supplies the water into the dishwasher. Did you forget to mention that was replaced? Check the water line for bends or crimps. To be sure water is getting into the dishwasher, turn the water supply to it off, then remove the water line from the bottom of dishwasher. Then using a bucket to collect the water, turn on the water supply to be sure it is flowing. If it is, then the water inlet valve is bad or something is clogged up. I will try the water inlet value. I did already make sure water was getting to the dishwasher by the above method. I then poured that water into the dishwasher to verify it was draining, which it did fine. Do you happen to have a PN on the water inlet? We need the full model number to give you the correct part number for the water inlet valve. An example would be DW80J7550US/AA-0000. We will assume that is your Samsung dishwasher model number (DW80J7550US/AA-0000). Also here is the User Parts Manual for your Samsung Dishwasher DW80J7550US/AA-0000. There are other parts near the valve that may be causing the issue. Check the user manual link above to see all parts. Hope this helps, let us know what you find. So, here is an update. I ordered the water inlet valve and installed it… nothing changed. I then started to evaluate what else it might be. -I removed the hose from the back of the valve, turned on the dish washer to see if the valve was being turned on. no water was being passed through the valve when I turned on the dishwasher. -I connected the valve to power to ensure the valve was indeed functioning correctly and it is. -Lastly I turned on the dishwasher and then connected the valve to power. water would flow into the dishwasher through a side wall opening but no water would flow through the bottom waterwall or either of the top sprayers. I tired multiple combinations of when I connected the valve to power during the cycle and I came up with the same result. (I used my phone inside Zip-Lock bag to confirm the waterwall was moving and where the water was coming in.) I’m not sure how I could attach them or if it would help but I have video. Also, the water coming in on the side wall was on the left about 1/3 of the way up. I’m guessing it was an overflow. Samsung dishwasher lights flashing are: auto, normal, delicate… Any ideas? That is s HIGH TEMP error. My samsung has normal, heavy, and quick lights blinking. Stops mid cycle. We have cleaned all the traps and fixed the seal. Please help. Thank you! If the Normal, Heavy, and Quick lights are blinking the dishwasher is registering a low-level water error. This means there is an issue in the float sensor. Check the float to see if there is something blocking it. If not, replace the float sensor. I have a new Samsung dishwasher, Model # DMT300RFW. When I go to start it water will start to fill, then it stops and flashes on the Heavy and Quick buttons and it won’t drain back out. I didn’t find that specific code above. So can you tell me whats wrong. On your Samsung Dishwasher: The heavy and quick lights flashing means Over Water Level Error. Remove the screen from inside the dishwasher. There will most likely be some water underneath with something blocking it. This causes it to not drain properly which then flashes the HEAVY and QUICK button lights for Over Water Level Error. Check to see if there are any foreign objects that may be blocking the drain. Remove anything that may be causing a blockage and run a test cycle to see if that solved the problem. Did this solve your issue? My Samsung dishwasher model # DW80F600UTS/AA. Will run parts of a cycle and then stop and flash smart auto/ normal and tonight started flashing delicate too. What can I try to fix it. Have already had to have work done on it once and it is less than 5 yrs old. The flashing SMART AUTO / NORMAL lights on your Samsung dishwasher means a HIGH TEMP ERROR. To fix it you need to clean or replace the ECS sensor. The sensor is located under the sump, and can be accessed by removing a few screws. Remember to disconnect power when working on your dishwasher. The ECS sensor is around 30 dollars. Samsung Dishwasher DMT400RHS/XAA is flashing Heavy and Delicate Lights. What does that mean? On a Samsung Dishwasher, when the Heavy and Delicate lights are blinking, this means an error from the temperature sensor. 1 – The water entering the dishwasher is not warm enough. Try turning off power to the dishwasher for 15 seconds and then back on. Before restarting the dishwasher, run hot water in the sink. When the water from the sink is hot, turn off the faucet and start the dishwasher. This should prevent the Heavy and Delicate lights blinking error from happening as hot water is now entering the dishwasher. 2 – The heater has failed during a sanitize cycle. Replace heater. Where can I buy a new heater? Try searching your model number on SearsPartsDirect to find the heater. I have a Samsung dishwasher model DMT610RHS/XAC. It’s flashing error code CE. Have turned off power to dishwasher to hopefully reset. Turned power back on, and once you touch the power button again the CE code appears again; the motor goes for a few seconds then stops, then it goes one for a few seconds more and again it stops all the while the CE code continues to flash. This d/washer has a pain from day one – I could say a lot more but that’s time I’ll never get back. Samsung dishwasher error code CE is related to the water temperature. Possibly the heating element or a thermistor may need to be replaced. Check to be sure your dishwasher is getting hot enough water from the start also. My dishwasher has a light blinking above the delicate cycle. The washer stops mid cycle and blinks. Any ideas? Before replacing parts or calling for service, try unplugging the dishwasher for 5 minutes and see if that may reset. Samsung dishwasher DW80F800UWS is not draining – Error Code oE. I have removed the drain hose and it is free of any debris and installed correctly. Removed filter and assembly to clean. Removed some stuff, nothing serious. Turned power off, attempted to run cycle, immediately turns to error code oE. Is it the control module that needs to be replaced or a sensor? How can I drain the water before anymore invasive investigating? I’ve got the same thing. I discovered that my dishwasher works fine if I remove the upper rack. As soon as I put it back in and try it, boom oE code. Seems like the high pressure jet of water that is supposed to spin the upper rack sprayer causes the error code. Probably to do with the flow restricting as it enters the spinning bit. I don’t know how to fix it yet, but at least I’ve got some idea on what is going wrong (in one case anyway). Our Samsung DW80J3020UBAA is stopping shortly after hitting start, it flashes Auto and Heavy….I can’t find what that means. Can you help. Samsung Dishwasher Error code “over fill” (flashing ‘smart auto’ and ‘heavy’ lights) cycle doesn’t start in time for water to reach over fill sensor. The easiest fix for this is to replace the ECS sensor. Can you tell us the model number of your Samsung dishwasher? We can help further from there. My Samsung DMT800RHS dishwasher stopped during a normal wash cycle. The WASH light is rapidly blinking and the control touch pad is totally unresponsive. I cut power to the dishwasher using the circuit breaker but when the washer came back on in was still blinking WASH and unresponsive so not even power reset cleared the fault. What is causing this? Is it anything but the main control board? Give it some time. At times the washer will blink when the door is shut. Try unplugging it again for 30 minutes. Plug back in and if the blinking persists, leave the dishwasher for a few hours. If the blinking does not stop, please let us know if any other buttons are blinking and if there is a pattern to the blinking. Is it a constant blink or is it blinking a number of times and then stops, and blinks again? Can you count the number of times it blinks if applicable? Let us know. The blinking is constant at around 2 blinks per second. I’ve left it powered off for over and hour and problem still persists. Only the WASH light blinks. There is an audible clicking with each blink. I have removed the reinstalled both the touchpad and the main control board without any different result. There was no obvious damage to either board. It would help if I knew what diagnostics could be run on the boards with a multi-meter. Samsung dishwasher flashing lights – Smart auto and normal. Drains at start and then starts flashing code. Any ideas? Have you tried unplugging the dishwasher from power to see if that will reset it? If the dishwasher drains when the dishwasher starts, that may indicate there is an issue with the control panel / board. I have checked and cleaned all hoses thoroughly. I run another cycle with the dishwasher pulled out from under the cabinet, so there was no kink in the hose. It washes fine until time to drain and I get another SE code. Could there be a faulty sensor? We have also checked the pump and there is no problem with it. Even though you are getting the error code SE on your Samsung dishwasher, does the dishwasher actually drain the water out at the end of the cycle or is the error code appearing and in reality, there is no problem with the dishwasher besides the error showing up? Is the dishwasher washing normally, rinses, but when it comes to drain, it DOES NOT drain and immediately after you receive the SE error code? If the error code is showing, it MAY be possible that the sensor is not working as designed, but that is very unusual if that is the case. We would think there still is a problem with the drain pump, hose or possibly in the wall where the water drains. Could there be a blockage down the line that is causing your issue? You have checked ALL hoses, water lines, and taken the pump apart and checked for foreign objects stuck in it and also made sure the drain pump is getting power? Is there will be an excessive amount of water in the bottom of your dishwasher after a cycle has been completed? My Samsung dishwasher is flashing a SE code. I have made sure the drain hose is clear, I have checked the pump. The pump is okay. The machine goes thru the cycle until it needs to drain the water and that is when it displays the SE code. Yes SE error code on a Samsung dishwasher means a drain error. What exactly did you check with the pump? Getting power, proper voltage, checked for foreign objects blocking it, wiring? The drain hose may be clear, but be sure it is not getting crimped or pinched when the dishwasher is back in place. Your IP address shows us FINLAND.